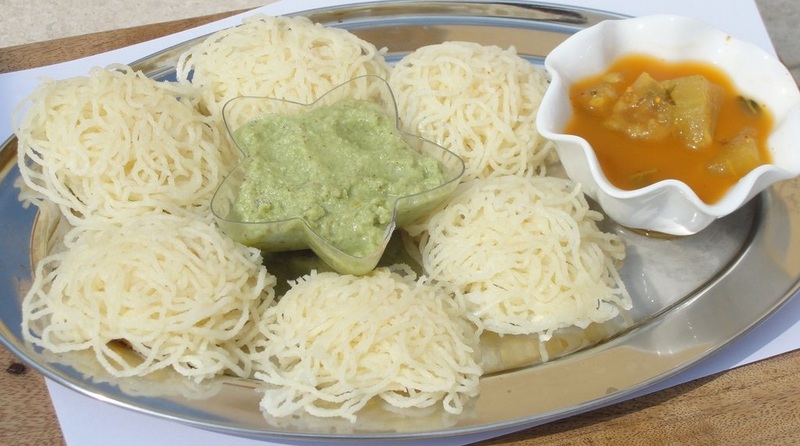 Idiyappam: Idiyappam or string hoppers are a traditional Kerala, Tamil and Sri Lankan food consisting of rice flour pressed into noodle form and then steamed. Idiyappam is culinary specialty in Kerala, Tamil Nadu and coastal areas of Karnataka and Sri Lanka. It is generally served as the main course at breakfast or dinner together with a curry (potato, egg, fish or meat curry) and coconut chutney. It is also served with sweetened coconut milk in the Malabar region of Kerala. Heat a pan on low flame. Dry roast the rice flour for 7-8 minutes. Bring 2 1/4 cups of salted water and ghee to a boil. Keep aside 1/4 cup of water (to be used while kneading the dough). Slowly pour the hot water (2 cups) little by little into the rice flour. It will be difficult to mix but try to bring it all together. Place lid and leave aside for 15 mts. While the dough is resting, grease the idiyappam maker and the idli plates. Sprinkle little grated coconut into each depression of the idli plate. The dough will be easier to handle once the heat reduces. Knead the mixture into smooth yet firm dough, adding 2-3 tbsps of hot water while kneading. Make a cylindrical shape of the dough. Place into the idiyappam maker. Close the lid of the idiyappam maker. Hand press the dough into swirls onto the idli plates. Serve warm with either sweetened coconut milk, Stew, Chicken or Egg curry. Soak 2 cups rice in water for 4 hours. Spread the rice on a thin cloth or newspaper. Allow to dry for half an hour to an hour. Once it’s almost dry, grind to a fine powder. Dry roast it on low flame for 7-9 minutes. Homemade Idiyappam flour is ready. If you have any queries about this Idiyappam Recipe, please write down in comment box below.